Suspended by an intricate tangle of carabiners and ropes at a point above my spine I held myself in place face down above the launch pad in an awkward rendition of a push-up position, wondering what I had gotten myself into. All too soon the guide said, “Ready?” Nodding in the affirmative I was given a push and suddenly I was airborne, flying over the tree tops like a bird, arms outstretched, zooming toward the landing pad at 40+ miles an hour. No, I wasn’t jumping from an airplane. 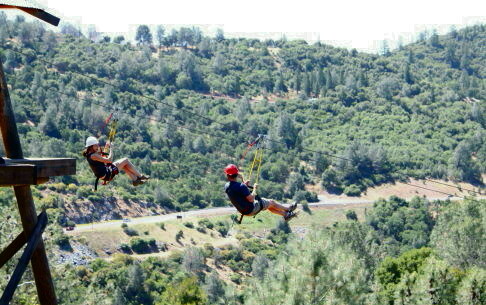 I was enjoying the thrill of a zip-line at the multifaceted Moaning Cavern Adventure Park in Calaveras County, but instead of the traditional semi-sitting position, which we had already done, my husband and I elected to go Super-style for our second ride. I loved the sensation of flying with no ropes visible beneath me, and feeling calmer on the second ride, could look around and enjoy more of the scenery. Taking a deep breath I inhaled the fresh, aromatic air wafting up from the green forest of oak and manzanita and gazed at the surrounding hills pf the Sierra Foothills browning in the blast furnace of heat emanating from California’s Central Valley as I whizzed by. After swooping in to the landing pad I looked around for my husband, Steve, but couldn’t find him anywhere. 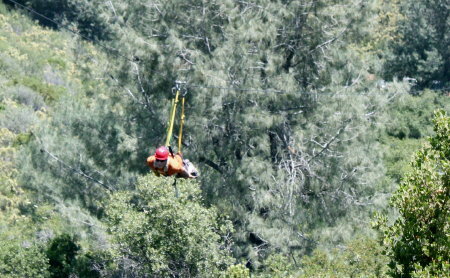 He couldn’t have gotten there that much before me since we were on parallel zip lines and departed at the same time. I was a bit giddy from the ride, but after I regained my wits I looked back at the launch tower, there was Steve laughing at his plight, hanging from the line about 50 feet back from where he was supposed to be. His “catch” loop had gotten tangled between his legs so he didn’t get caught and catapulted backwards. No matter—he was perfectly safe, but a staff member had to clip into safety gear and travel hand over hand to fetch him and we joked that he got an extra ride. Moaning Cavern Adventure Park, which features the zip line, climbing tower and gold panning in addition to a cave walk, rappel and crawl, has plenty of excitement for the adrenaline junkie along with family oriented pleasures. The zip line was a good place to start since we were there early, before the lines got too long as this attraction has proven to be very popular. Talking to Keith Armbruster, manager of Moaning Cavern, he emphasized how important safety is to everyone on staff. An escapee from the high tech world of Silicon Valley, he’s found a second career overseeing a large group of young people who are expert with ropes and caving skills. He instills a healthy respects for OSHA regulations and insists on the highest degree of customer service, which was evident from the many contact points we had with the staff, each and every one of whom was unfailingly polite, patient and helpful, in spite of almost overwhelming demand as the day progressed. We entered the refreshingly cool cave offering a respite from the 90 degree temperatures at mid-day. 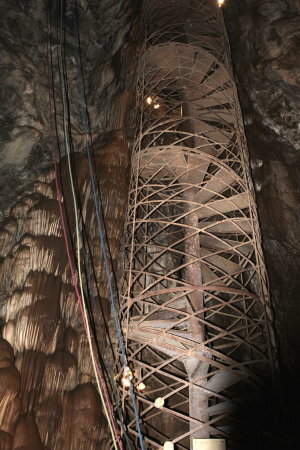 The tour, involving walking down 234 steps in a circular staircase (and back up for a total of 468), had me a bit dizzy from going in circles down 165 feet. The geology of the 25 foot rock formations, as well as ancient and modern history of the cave was described by a knowledgeable guide along the way. We learned that the cave lost its namesake “moan”, caused by water dripping into narrow holes, after the staircase was built in 1922 using steel from a World War I battleship, when debris clogged the moaning holes. The largest public vertical vault cave in California, the main room could easily accommodate the Statue of Liberty. Below the open chamber a series of passageways extends the cave to 410 feet, accessible by belly crawling. We were intrigued by the human bones at the bottom of the cave, some of the hundred or so prehistoric explorers who met their death by an untimely fall, likely after being attracted by the sound of the moan and peering into the original small opening at the top. We saw other adventurers rappelling down the face of the cave, a preview of what was to come. Asking a woman at the bottom who was coming off the rappel what she thought of the experience, she shuddered and said, “That was the scariest, most intense thing I’ve ever done in my life.” Not exactly encouraging but very brave someone who had never even been rock climbing. We emerged, blinking, into bright sunshine, and enjoyed a snack while we relived the memory of frisson of the zip line and contemplated our next adventure. Unfortunately no substantial food is sold at the park, but many families were enjoying picnics they had brought with them. We were excited about rappelling but I thought the crawl might be too claustrophobia-inducing for me. After experiencing the thrill of the zip-line and seeing the lay of the land in the cave we soaked up some sun and decided on the rappel for the next adventure. 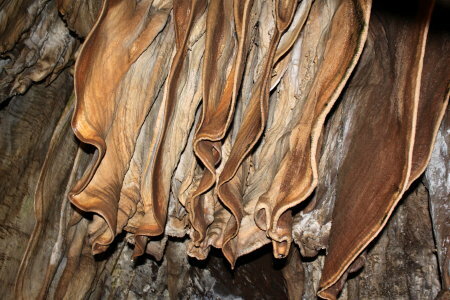 See related article: “Thrill seekers find adrenaline rush rappelling down Moaning Cavern“. Open year round; hours vary from 9 or 10 am opening to 5 or 6 pm closing depending on season and day of week.